Urban development remains an important agent of environmental change in the United States. The U.S. population grew by 17 percent from 1982 to 1997, while urbanized land area grew by 47 percent, suggesting that urban land consumption far outpaced population growth (Fulton and others, 2001; Sierra Club, 2003; American Farmland Trust, 2009). Eighty percent of Americans now live in metropolitan areas. Each American effectively occupies about 20 percent more developed land (for housing, schools, shopping, roads, and other related services) than 20 years ago (Markham and Steinzor, 2006). Passel and Cohn (2008) predict a dramatic 48 percent increase in the population of the United States from 2005 to 2050. The advantages and challenges of living in these developed areas—convenience, congestion, employment, pollution—are part of the day-to-day realities of most Americans. Nowhere are the environmental changes associated with urban development more evident than in urban streams. The U.S. Geological Survey's National Water-Quality Assessment (NAWQA) Program investigation of the effects of urban development on stream ecosystems (EUSE) during 1999–2004 provides the most spatially comprehensive analysis of stream impacts of urban development that has been completed in the United States. A nationally consistent study design was used in nine metropolitan areas of the United States—Portland, Oregon; Salt Lake City, Utah; Birmingham, Alabama; Atlanta, Georgia; Raleigh, North Carolina; Boston, Massachusetts; Denver, Colorado; Dallas, Texas; and Milwaukee, Wisconsin. A summary report published as part of the EUSE study describes several of these impacts on urban streams (Coles and others, 2012). 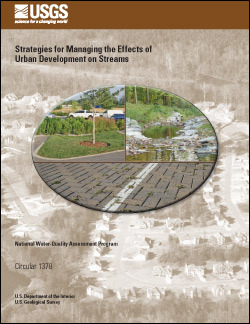 Cappiella, Karen, Stack, W.P., Fraley-McNeal, Lisa, Lane, Cecilia, and McMahon, Gerard, 2012, Strategies for managing the effects of urban development on streams: U.S. Geological Survey Circular 1378, 69 p., available at https://pubs.usgs.gov/circ/1378/.